Assesses water quality in wadeable rivers and streams: Rotating assessment identifies which streams are healthy and which have impaired health, and how suitable each is for various human uses including swimming. Supports broader water management decision-making: Wadeable river and stream monitoring provides information to inform targeted management actions to prevent and mitigate degradation. Evaluates the effectiveness of management actions: Data from monitoring wadeable rivers and streams tracks whether policy changes, permitting decisions, and infrastructure improvements are having their intended effect. Rhode Island has about 1,400 miles of rivers, from small headwater streams (the very beginning or source of streams and rivers) to major waterways like the Blackstone and Pawtuxet Rivers. The vast majority—upwards of 85 percent—of these freshwater flows are wadeable, small and shallow enough to sample without a boat. The condition of these smaller streams strongly influences the water quality in the larger rivers into which they drain. Wadeable rivers and streams feed surface water reservoirs that are the source of a majority of Rhode Island’s drinking water supply, and the larger Pawtuxet River drains out of the Scituate Reservoir. These waters and their adjacent lands are also valued for providing a variety of outdoor recreational opportunities including kayaking and canoeing, fishing, hiking, and birdwatching, to name a few. Wadeable rivers and streams provide important natural habitats that support a diversity of both aquatic and terrestrial species. Fish, amphibians, and reptiles rely on river and stream habitat for some or all of their life cycles. There are other creatures that may go unnoticed by the casual observer, but form an essential part of the aquatic food chain, including benthic macroinvertebrates (small animals that live in stream beds, can be seen with the naked eye, and have no spinal cord) such as insect larvae, snails, worms, and freshwater mussels and clams. This group of organisms feeds on bacteria, algae, and decaying organic matter (such as dead leaves) and are in turn eaten by fish and other predators, making them an important link between organic matter that enters the aquatic environment from the land and larger organisms that live in the rivers. Benthic macroinvertebrates are a well-established biological indicator of the health of a stream or river. Most of these organisms are not as mobile as larger vertebrates such as fish and amphibians, so they are strongly connected to the water quality at a specific location and reflect the cumulative stress on the river or stream. Water testing for pH, dissolved oxygen, and nitrates, among other parameters, which are also used to characterize water quality and identify pollution, is representative of water quality at the specific moment in time samples were taken. Different species also have different water quality tolerances: streams with poor water quality tend to have fewer species, including leeches, aquatic worms, and blackfly larvae. Streams with good water quality tend to have more species, including mayfly larvae, dragonfly larvae, and crayfish in addition to the species that tolerate poorer water quality. 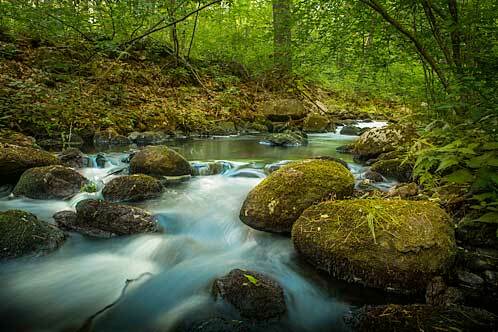 Long-term monitoring efforts in wadeable rivers and streams enable Rhode Island researchers and managers to track environmental trends and patterns within watersheds. It also helps to identify specific river segments and streams that exhibit poor water quality or degraded aquatic habitat so proper management and restoration plans can be pursued. Protecting smaller streams and rivers in the Narragansett Bay watershed is needed not just to ensure healthy freshwater ecosystems but to also contribute to protection of bay water quality. 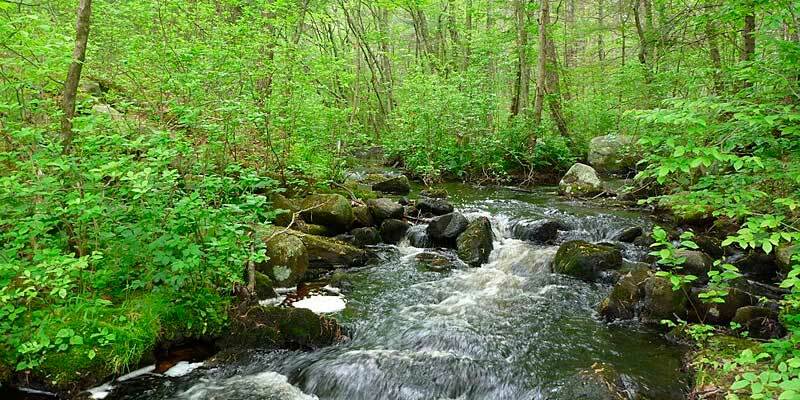 Our freshwater systems start with many small, headwater streams that flow together to form larger streams, which flow together to form small rivers, which flow together to form large rivers, which empty into Narragansett Bay. In this way, excess nutrients, harmful chemicals, bacteria, and other pollutants in streams can make their way into the bay. Since excess nutrients can, among other issues, cause algal blooms that lead to hypoxia and resulting fish kills, nitrogen levels (a key nutrient for algae blooms) are a primary managerial concern in Narragansett Bay. Significant investments have been made to reduce nitrogen inputs by upgrading wastewater treatment facilities (WWTFs). While WWTFs remain the largest source of nitrogen to the bay, recent reduction efforts have resulted in other sources of nitrogen now make up a larger percentage of the total nitrogen pollution in the bay. These sources include lawn fertilizers, septic systems, and pet and animal wastes. Taking steps within the landscape to prevent nitrogen from entering streams can contribute to the overall management strategy for reducing the nutrient enrichment in the bay and lessening the potential for algal blooms and fish kills. Small actions can add up and reduce nitrogen that flows into these small streams, and eventually the bay. Mitigation actions include the re-establishment of naturally vegetated riparian buffer zones along a stream, proper maintenance of septic systems, and careful use of fertilizers. Ultimately, education and cooperation play an important role in implementing solutions to improve the bay. RI NEMO (Nonpoint Education for Municipal Officials) is one such program, providing information, educational opportunities, and assistance to local decision-makers to support smart land use decisions that protect water quality.